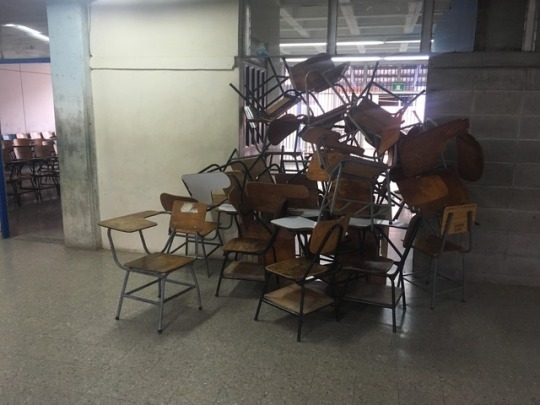 While on my way to interview a professor at the Universidad Nacional Autónoma de Honduras in Tegucigalpa, I noticed a stack of chairs blocking the entrance to a classroom. One of our fixers, Paulo Cerrato, explained that this was part of an ongoing student protest. Students who are involved in the protest want the university’s Rector, Julieta Castellanos, to resign. Before we even entered the building, students were blocking the door and first asked why we were there before allowing us inside. Having only witnessed firsthand student protests in the United States, it was striking to see them unfold here in Honduras.